When it comes to users, the largest single market is Brazil, with 28.7 million broadband subscribers at end-2017. Next is Mexico with 17 million and then Argentina with 8 million. The top five markets combined account for more than four-fifths of all the region’s users. 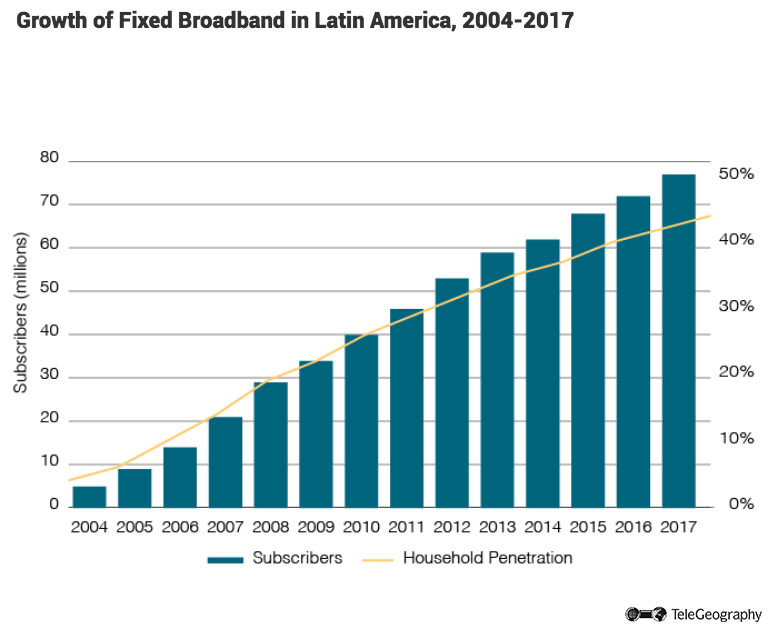 As far as technology goes, DSL connections contribute more than 44 percent of all broadband lines in Latin America and the Caribbean, with Brazil home to 13.1 million DSL subscriptions–more than 38 percent of the regional total. Although DSL is still the dominant technology for fixed broadband access, its share of total lines is declining, falling five percentage points in 2017 alone. As far as technology goes, DSL connections contribute more than 44 percent of all broadband lines in Latin America and the Caribbean, with Brazil home to 13.1 million DSL subscriptions–more than 38 percent of the regional total. 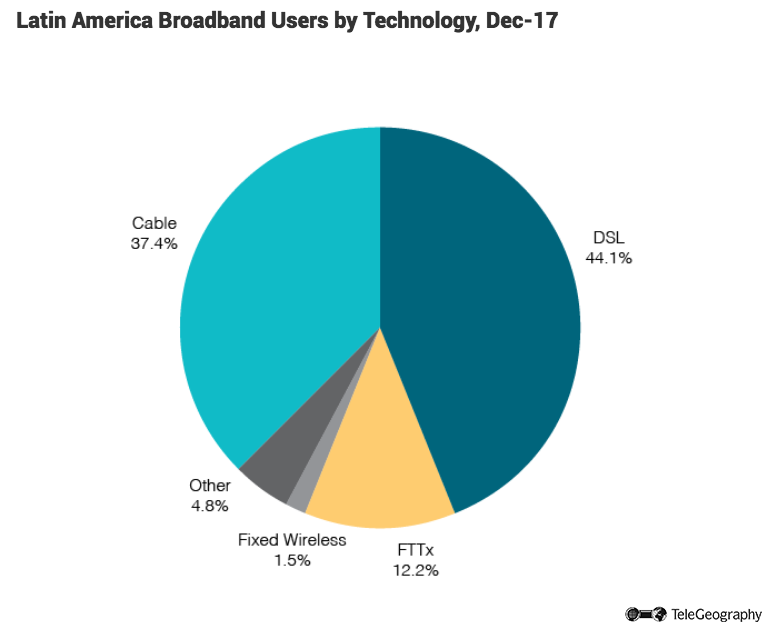 The next most popular technology for broadband access is cable, with almost 9 million subscriptions and 37 percent of the total (up from 36 percent a year before). Fiber-optic services make up a growing slice of the fixed internet sector, with 12 percent of all connections at December 2017, up from nine percent a year earlier. The remaining lines are accounted for by fixed wireless, satellite, and other technologies. Brazil ended December 2017 with a total of 28.7 million fixed broadband accesses, up from 26.6 million one year earlier. This boosted the household penetration rate to around 43 percent, which is on a par with the regional average. Claro Brasil, which incorporates fellow America Movil subsidiaries NET Servicos and Embratel, led the market at end-2017 with 8.9 million subscribers, equivalent to almost a third of the country total. Claro Brasil, which incorporates fellow America Movil subsidiaries NET Servicos and Embratel, led the market at end-2017 with 8.9 million subscribers, equivalent to almost a third of the country total. Its main rivals are full-service providers Telefonica Brasil (Vivo, 26 percent share) and Oi (20 percent). Vivo surged past Oi in May 2015 when it completed the $8.2 billion (EUR7.5 billion) acquisition of Vivendi-backed Global Village Telecom. The deal boosted Vivo’s user base by some 3.2 million high speed internet users, the bulk of which were connected via fiber-to-the-home technology. 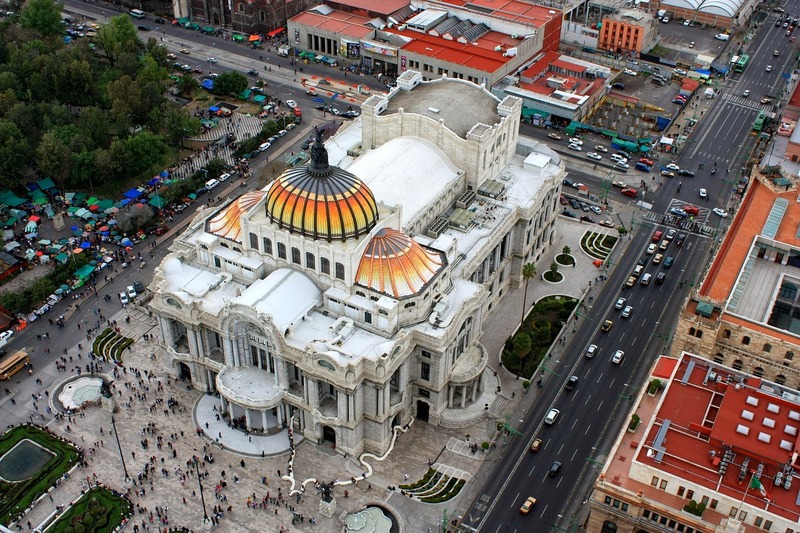 Mexico’s fixed broadband sector has been responsible for much of the growth in the country’s telecom industry in recent years, with approximately 17 million users as of December 31, 2017. This is up from 16.3 million one year earlier and equivalent to a household penetration rate of more than 57 percent, well above the regional average. America Movil-backed fixed line incumbent Telmex launched its first ADSL service in 2002 and continues to dominate the broadband market. It boasts the country’s largest fiber-optic backbone network, which extends for more than 200,000km and passes 20 million homes, with ADSL available in more than 1,200 towns and cities. It claimed 9.3 million internet customers at end-2017, accounting for more than half the local retail market, well ahead of nearest rival Megacable, which had a share of around 15 percent at the same date. In contrast to its saturated wireless market, there remains room for growth in Argentina’s still-developing fixed broadband sector, which boasted an estimated 8 million connections by December 31, 2017. This is equivalent to a household penetration rate of roughly 59 percent. The make-up of the sector changed radically at the start of 2018 with the merger of the number one and two players, Telecom Argentina and Cablevision, in a move spearheaded by the companies’ mutual shareholder, Grupo Fintech. The tie-up has created an entity that controls more than half of Argentina’s broadband subscribers. The continuing popularity of multi-play broadband, pay-TV and telephony packages is expected to lead to further growth in Latin America’s fixed internet sector. 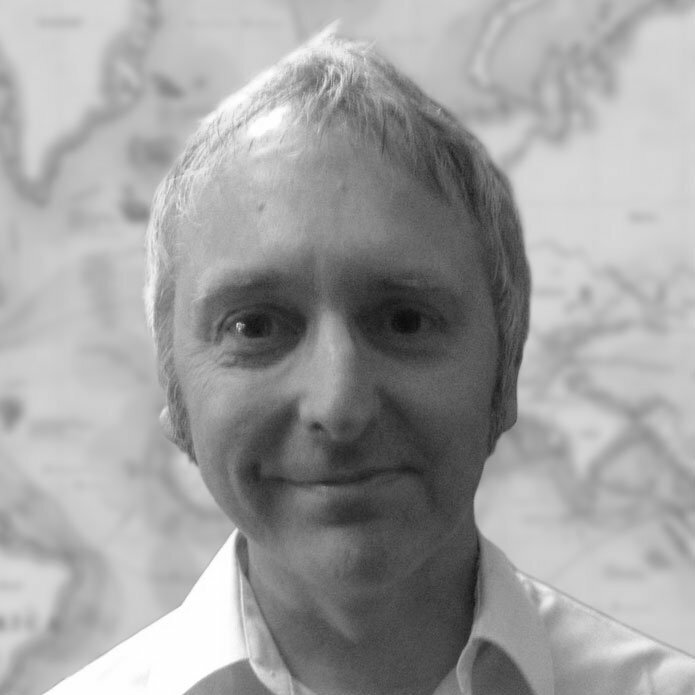 TeleGeography’s GlobalComms Forecast Service predicts that the number of fixed broadband connections in the region will rise to 96 million by the end of 2022. Connectivity and Pricing in Latin America: Anahí Rebatta recently presented Exploring the Current State of the Wholesale Telecom Industry Across Latin America at Capacity LATAM. Check out her findings here. All Change in Argentina: The recent Telecom Argentina and Cablevision deal marks the latest in a long line of notable telecom developments since Mauricio Macri was elected Argentina's president in November 2015. Read all about it.